The Astoria Scandinavian Midsummer Festival Association (ASMFA) is in the process of planning our 2019 festival this year. Festival dates are: June 21, 22, & 23, 2019. Completed applications and payment are due no later than April 16th, 2019. Your application will not be accepted, or may be returned if it is not complete, or if full payment has not been received. You can use the online form below, but your payment still needs to be mailed in by April 16, 2019 to be considered. Please Note: We require that all of our vendors and entertainers reflect the style and culture of Scandinavian heritage in their products, food, and music. Our festival makes every effort to offer as much authentic Scandinavian culture as possible. We encourage vendors to dress in Scandinavian attire and to decorate their booths with Scandinavian décor, if possible. Booths representing handmade, quality items are given priority. We accept craft and informational booths and can accommodate both indoor and outdoor vendors. We recommend that outdoor booths be self-contained due to unpredictable weather and no night security. Electricity is limited for outdoor booths and will be provided on a first come, first serve basis. Booths are divided by white, wood partitions that are partially decorated with cedar and birch. Vendors may hang décor and other items on the partitions, but all staples, tape, and décor must be removed by vendor at the end of the festival. Green curtains hang behind each booth. Bring your own: staple guns, pliers, extension cords, and other supplies you may need to set-up/tear-down your booth. The above will be provided to you upon Check-In at the festival. 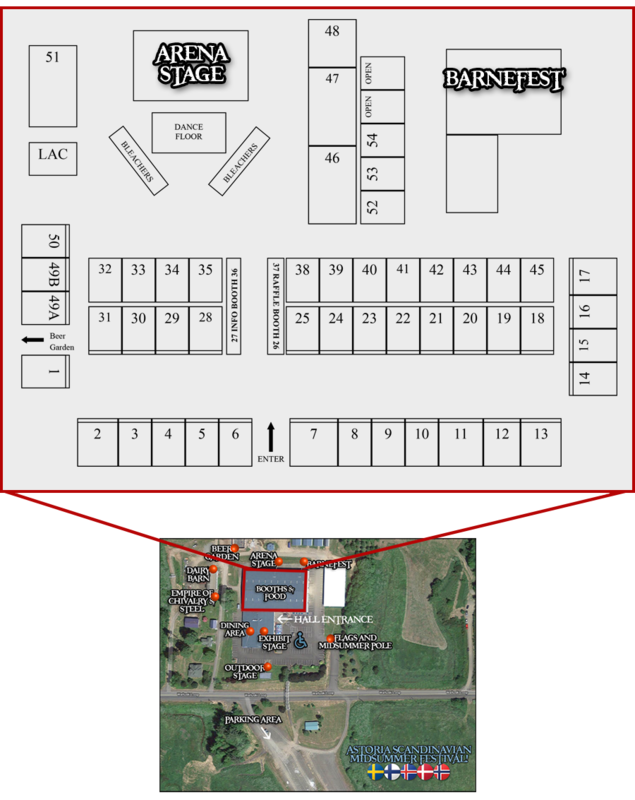 All booth vendors/volunteers MUST wear an Admittance Wristband while at the festival. Non-Profit organizations (distributing information only) may request a booth at no cost. Informational booths may not sell anything. Booth Set-Up is allowed only during the above designated times, unless special arrangements have been agreed upon with the booth committee. Booth space is NOT to exceed requested booth size – placing racks/stands, etc. beyond the measurements of your booth will not be permitted. Friday - Doors to the Arena (location of indoor booths) will be locked after booth closing times. Saturday – the closing time for booths will be dependent on if there is a “Special Event” scheduled for Saturday evening in the Arena. If there is a Special Event, booths and the arena will close promptly at 6:30pm. Doors will reopen for the Special Event at approximately 6:45pm. The Festival Association will have professional Security Service to provide security through the duration of the event. Once the event is over and the arena has been cleared-out, the area will be locked. If there is not a Special Event taking place Saturday evening, booths will stay open until 7:00pm. Please see www.AstoriaScanFest.com for more information. Saturday and Sunday – Doors to the Arena will be opened at approximately 8:00am for vendors to get ready for the day. Note: Booths may NOT be dismantled prior to 4:00pm on Sunday. If you sell out of your product(s), please place a sign in your booth that simply says “SOLD OUT”. Booth placement will be finalized by approximately, May 1st, 2019, after which a confirmation letter with final details will be sent. YOUR CONFIRMATION LETTER IS YOUR BOOTH ACCEPTANCE LETTER. Food Booths – please check with the Health Dept for food handling requirements. You will receive a FULL REFUND, if your cancellation is received by June 1st, 2019. If your cancellation is received after June 1st, 2019, you will receive a refund for HALF the cost of your total booth fees (including electrical fees). Electricity is provided on a first come/first serve basis. 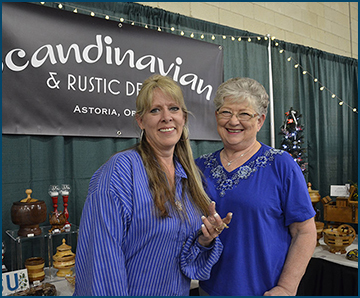 To apply online to become a vendor at this year's Astoria Scandinavian Midsummer Festival, please completely fill out the following form. Then, send your check in for the total amount due by April 16. Your online application will not be considered until we receive payment in full. Terms & Conditions: Insurance & Liability: Neither the Scandinavian Midsummer Festival Association, Clatsop County, Clatsop County Fair Board, nor any and all sponsors shall be responsible for loss or damage occurring to vendors or their contents for any cause. If insurance is required, it must be obtained by the organization or individual renting the booth space. 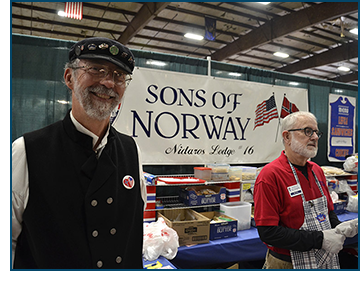 The organization agrees to protect and hold harmless the Scandinavian Midsummer Festival Association., Clatsop County, Clatsop County Fair Board, and any and all sponsors of this event, their successors, representatives, and assignees, for any injuries suffered while participating in the ASMFA 2019.